One week ago, our forecast looked downright scary, as Hurricane Florence's forecast painted a worst-case scenario for New Jersey. As time went on, the influence of a dome of high pressure in the northern Atlantic steered Florence away from us. Unfortunately, we're about to see some devastating images of flooding and wind damage from the southeastern United States. But here in New Jersey, impacts will be minimal. On this Thursday morning, we're once again waking up to damp conditions. A batch of overnight rain has thoroughly moistened roads throughout central and northern New Jersey. As of this writing, scattered rain continues in the area around Interstates 78 and 80. Patchy fog has also developed, although it doesn't look as thick or as widespread as Wednesday morning. With visibility occasionally droping to a quarter-mile or less, a Dense Fog Advisory has been issued until 10 a.m. for the Jersey Shore. That includes Atlantic, southeastern Burlington, Cape May, Cumberland, Middlesex, Monmouth, and Ocean counties. Thursday night will once again feature clouds, humidity, and the potential for patchy fog once again. The reduced visibility is not a guarantee overnight — if a little breeze kicks up, it will keep the air stirred up just enough to prevent any fog from forming. Hurricane Florence has shown a weakening trend over the last 12 to 24 hours. As of 5 a.m., Florence is a strong category 2 storm, with maximum sustained winds of 110 mph. The decrease in intensity doesn't mean much for the expected impacts — the storm has just become larger, with a slightly degraded eye wall. 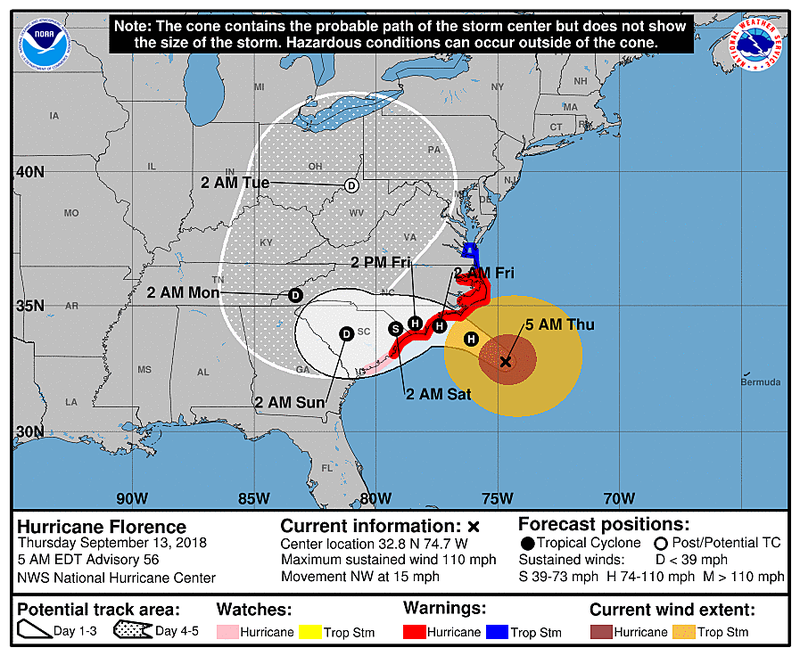 The center of Florence is about 200 miles east-southeast of Wilmington, North Carolina. On Friday, New Jersey will end up on the very northern edge of Hurricane Florence. So, at the very least, it will be cloudy and breezy (especially along the coast). Wind gusts to 30 mph will be possible. 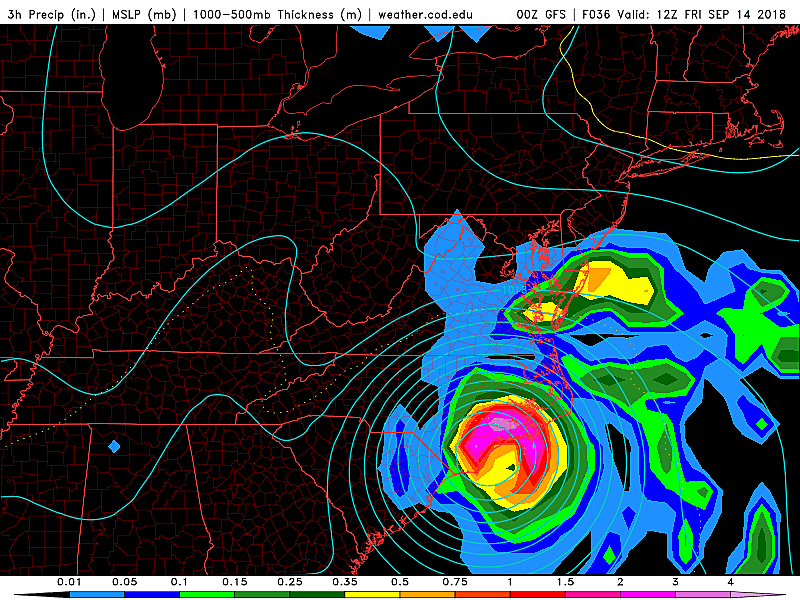 And there's a reasonable chance that a rain band from Florence drifts into southern New Jersey at some point Friday. 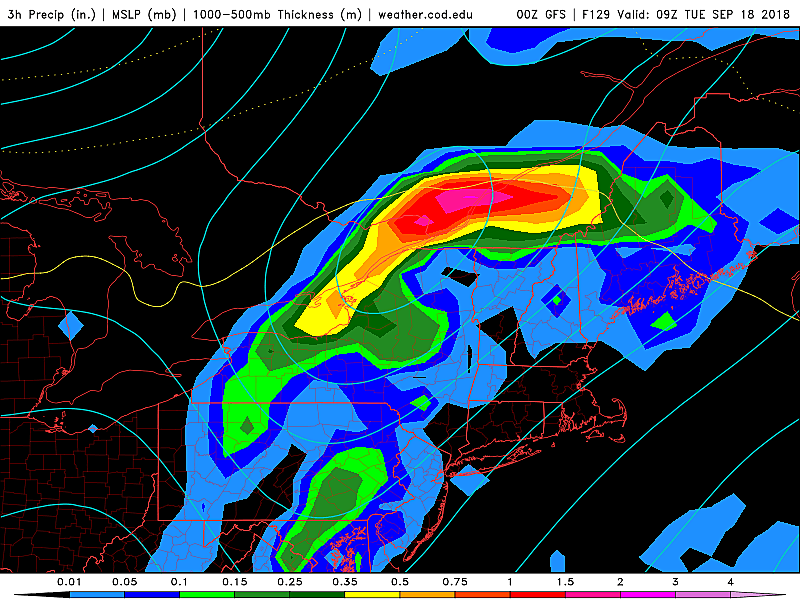 I don't think we'll see anything heavy or any flood potential. So the Garden State's biggest impact from Hurricane Florence will be a high risk for rip currents and rough surf, with 5 to 8 foot ocean waves expected Thursday. The big waves will probably continue through the start of the weekend. The coastal flooding picture along the Jersey Shore looks minimal though, I'm happy to report. Surge of less than a foot will cause little to no water inundation issues here. Then along comes the weekend. And the weather actually looks nice for a change! Most of New Jersey should clear to at least partial sunshine on Saturday. I think South Jersey will be close enough to Florence to maintain mostly cloudy to cloudy skies through the weekend, unfortunately. It should still be dry and seasonably warm. Look for upper 70s for the southern half of the state (under the clouds) on Saturday afternoon. We'll probably hit 80 degrees further north in New Jersey. As we've discussed all week, there is one more concern regarding Florence. As the storm pushes inland this weekend — as far west as Tennessee and Kentucky — it will weaken significantly. But it will also get caught up in the west-to-east jet stream and steer toward the northeast U.S.
Florence may technically be classified as a "subtropical depression" by the time — I prefer to call it "remnants," as the tropical moisture will be highly disorganized and the wind threat very minor. The latest model guidance shows a round of remnant rainfall pushing through New Jersey on Tuesday, with maybe an inch of total rainfall. I'm wary about that number though, for two reasons. First, rain storms of tropical origin have a tendency to surprise and overperform. And second, this forecast is highly track-dependent — if the center of Florence's remnant low passes closer to New Jersey, we ultimately could up with several inches of rain. Given the moist antecedent conditions (in other words, the ground is wet), any heavy rain could produce flooding very quickly. So despite the lovely weather this weekend, I'm still going to continue watching and talking about Florence until she finally departs the United states. That is my job, after all.